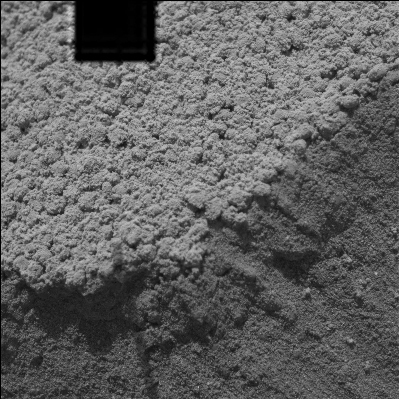 NASA's Mars Exploration Rover Spirit took this pair of microscopic imager pictures of the drift dubbed "Serpent" on Spirit's 73rd martian day on Mars after successfully digging into the side of the drift. The left image, which has a black box at the top caused by missing data, captures a transition part of the drift where lighter, undisturbed material meets disturbed, darker material. The microscopic view of the undisturbed material reveals sphere-like grains with diameters between one and two millimeters (.04 and .08 inches), which are similar to the grains Spirit observed in other drift areas near Spirit's landing site, Gusev Crater. These larger grains form a single layer or crust on the surface of the drift and are covered in a fine layer of martian dust. The right image is the first-ever microscopic look inside a drift. It captures only the scuffed interior of the Serpent drift and is dominated by larger pea-shaped particles. These grains are not natural to the inside the drift, but are crust particles that have tumbled into the scuffed area as a result of the digging. These grains lost their dust cover in the process of falling into the scuff, giving scientists clues about the strength - or lack of strength - of the bond between the dust and sand particles. Most interesting to scientists are the fine grains making up the interior of Serpent drift. The grains of sand found within drifts or dunes on Earth are usually about 200 micrometers (.008 inches) in diameter -- much like sand on a beach. On Earth, dunes are formed when sand particles of this size are bounced across a surface by wind and collect together as drifts. Smaller particles, like the ones making up Serpent drift, would not necessarily collect into a dune on Earth, but would more likely be distributed across the surface like dust. The fine grains making up the interior of Serpent drift are no larger than 50 or 60 micrometers (.002 inches) and can be compared to silt on Earth. How did this very fine material managed to accumulate into a drift? Earth-based tests that simulate the wind speed and atmospheric density of Mars have found it difficult to reproduce dunes with grain particles as small as those found in the Serpent drift. However, Earth-based tests cannot duplicate the gravity of Mars, which is one-third that of the gravity on Earth. This environmental factor is a likely contributor to the diminutive material making up Serpent drift.